A cou­ple of weeks back I men­tioned the RIMA lamp by Dreipuls. I was kind of bummed as it looks more fash­ioned towards those with laptops/notebooks. Then I saw the Z-Bar Desk Lamp by Kon­cept Tech­nolo­gies. 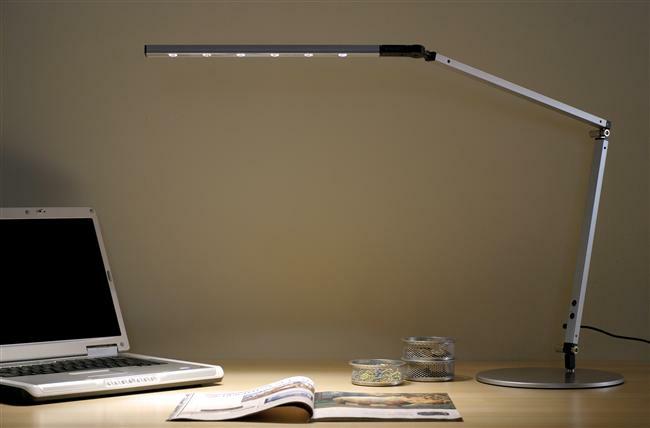 Z-Bar Desk Lamp fea­tures the award-win­ning three-bar design for ulti­mate reach and flex­i­bil­i­ty. The super-adjustable LED head can spin in its sock­et, sweep side to side, and rotate around the end of the arm to point in any direc­tion. The touch­strip is locat­ed near the LED head for easy access. Slide your fin­ger along the strip to dim grad­u­al­ly, or touch the strip any­where to jump direct­ly to any bright­ness, includ­ing off. Com­pat­i­ble with option­al occu­pan­cy sen­sor. Such a beau­ty. I also noticed that the Z-bar is also clamp-able. Which is good if you can only afford so much desk space for a lamp. Oth­er than hav­ing a styl­ish, com­pact design, it is also “green”—about 50,000 hours life span on its LED bulbs.